MainAll NewsInside IsraelNext year in Sa-Nur! Samaria evictees present PM with matzah baked in Sa-Nur, request he cancel Disengagement Law and let them return to homes destroyed in 2005. About 100 evacuees from Sa-Nur and Homesh in northern Samaria (Shomron) arrived with their children 12 years after the expulsion to bake matzot in Sa-Nur, one of the five communities in Samaria uprooted in 2005 as part of the Disengagement from Gaza and northern Shomron. The displaced people forced to leave Homesh and Sa-Nur came to visit out of longing for their home and to publicize the families' demand to cancel the Disengagement Law in northern Samaria, after it became clear that unlike Gush Katif, the place remained under full Israeli control, with the uprooting of communities there having achieved nothing. There was great excitement among the evacuees who arrived. Soldiers in Sa-Nur also joined in the matzah baking. "Like every time we come to Sa-Nur, the children jump out of the bus excitedly, and they feel right at home," said Alice Ziman, who was expelled from the village. "It feels like a place we left for a moment and return to as an old acquaintance. There was great excitement that spread to the soldiers who also joined the mitzva of rejoicing." Shomron Council head Yossi Dagan, who was expelled from Sa-Nur himself, called it a difficult and exciting moment. 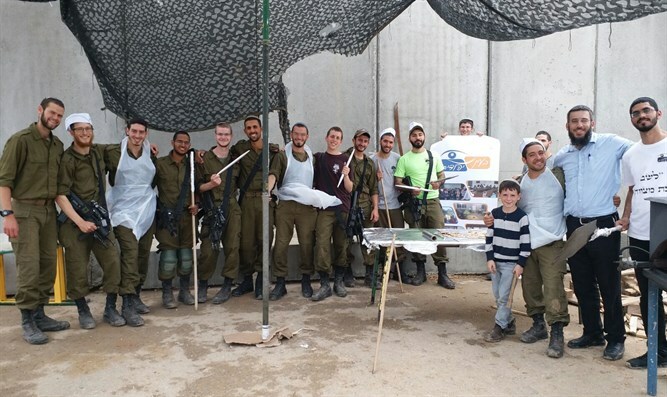 "On the one hand, unlike our friends from Gush Katif, we've been able to return home to the destroyed settlement, bake matzot, and bring a bit of life back to the community. "Why were the communities uprooted?" He asked, "Why did they drag us off this land and force us out of our homes? The entire place remained under full Israeli control. The State of Israel made a mistake, and the State of Israel with the most nationalist government it ever had must now correct it. Just before Passover we call upon the Israeli government to allow all of us to go free. Free yourselves from international entanglements and allow families to return home." After baking the matzah, the evacuees gave it to Prime Minister Netanyahu and his wife through the Prime Minister's head of staff, Yoav Horowitz, and to Justice Minister Ayelet Shaked, who received her matzah from a little girl and said, "Thank you sweetheart! I'm sure it's tasty and I promise to eat it."